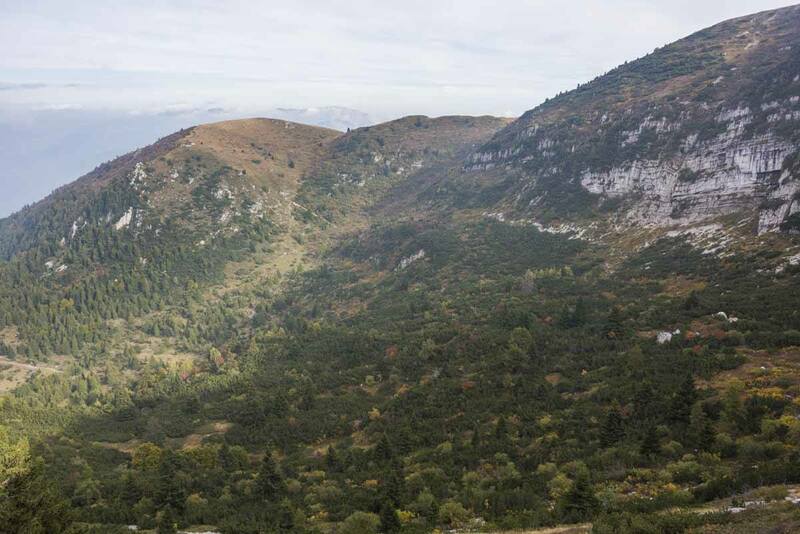 Welcome to Monte Altissimo, the destination of our second instalment of GardaTrek – after summer, we’re hiking some more of the wonderful Top Loop trail – in autumn this time! The more we travel to Garda Trentino, the more we find reasons to love it. The northern part of Italy’s largest lake is an adventurer’s playground – besides hiking and mountain biking, you can also go kitesurfing, canyoning, paragliding, climbing… there’s truly nowhere better to be in Italy, if you like nature and adventure. Out of all the activities available between lake and mountains, hiking gets a special mention. Don’t get me wrong – the lakeside villages are a real delight, with pastel buildings and a hybrid Italo/Germanic architecture, revealing that the area was historically border country. Yet, it’s only by heading to the mountains and climbing, climbing slowly, that the full beauty of the lake reveals itself to the adventurer. One switchback after the other, one footstep after another on the mountain paths, the lake starts to appear down below – first, it’s only a sliver of blue, the mere suggestion that something is indeed there. Then its beauty starts to unfold, until you have a shimmering expanse of aquamarine, ruffled by l’Ora del Garda, the afternoon wind that blows throughout the year. GardaTrek is a new set of trails, recently opened by the local tourism board and mountain clubs – three loop-shaped trails at various heights, allowing hikers to enjoy marvellous lake views all year round. The 7-day Top Loop, the highest of the three, crosses ridges and mountaintops – for this reason, it can only be hiked in the warmest months of the year, until mid-October at the latest. 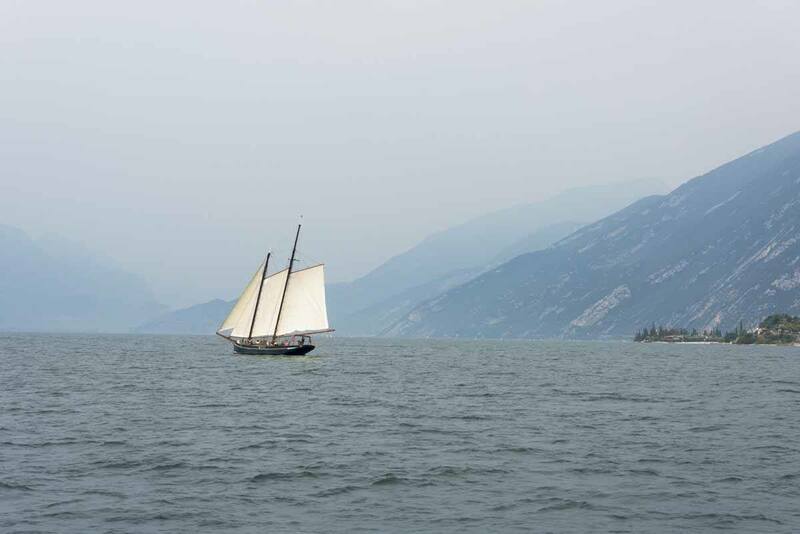 We already visited Lake Garda in July, when we hiked a two-day section of the Top Loop. However, in July, the weather was far from ideal for hiking. The Garda region is known for its ‘Mediterranean microclimate’, allowing olive and lemon trees to grow on the foothills of the Alps – but when we visited, the weather was beyond Mediterranean. Temperatures had been exceeding 35° for over a week. It was hot and humid, and a murky haze hung over the lake, hiding it from sight. September is a better time to hike – temperatures are lower and the air is clear and crisp. You don’t need to carry your body weight in water – a great help, on the steep, high paths – and there’s a higher likelihood of lake views, as you traverse the high mountain ridges. For this reason, in late September we planned an autumn hiking expedition to Rifugio Altissimo Damiano Chiesa, the highest mountain hut in the whole of GardaTrek, situated at 2060 meters above sea level, close to the peak of Monte Altissimo. The name ‘Monte Altissimo’ in Italian means ‘very high mountain’ – standing on its top you’ll truly be on the summit of Garda Trentino, where you’ll be able to enjoy views over the lake stretching all the way down to the southern shore, and even to the Venice Lagoon, on particularly clean days. We set off on a cloudy, cool afternoon. The trail to Monte Altissimo starts in the lakeside village of Nago, but wanting to skip the long, boring ascent through the woods with no views, we organised a transfer to a car park in a location called Prati di Nago, from where we’d have to walk about two hours to the Rifugio. The autumnal equinox was only a few days before, but the season of colours seemed to already be well on its way. The treetops had lost the verdant fullness of summer. Some of them were starting to turn bright orange, the colour of embers in a burning fire, whereas some bushes bordering the path were the same shade as ripe plums. 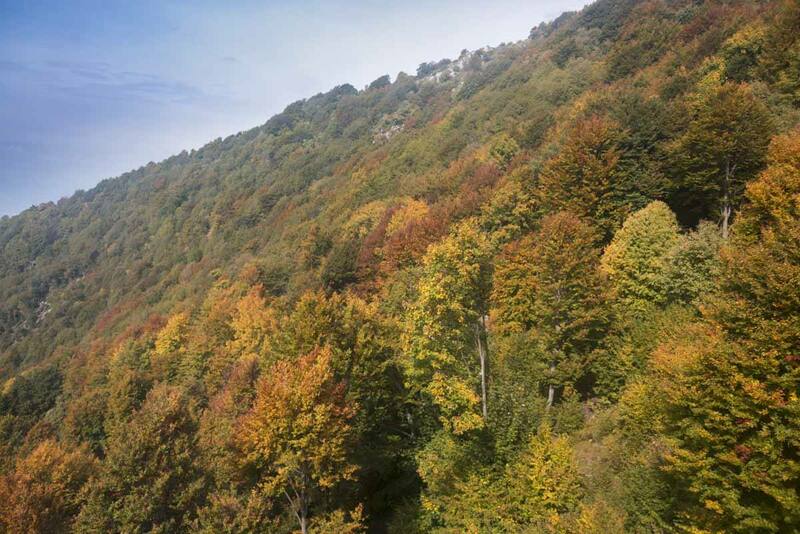 A carpet of russet-hued leaves covered the bottom of 601, the trail that we would follow all the way to the top of Monte Altissimo. Yet, the dominant colour in the landscape was still green – not the vibrant, yellowy green of spring, or the warm green of summer, as soft as an embrace – the autumnal green of Garda Trentino had a earthy tint that suggested passing, transience, the end of things. 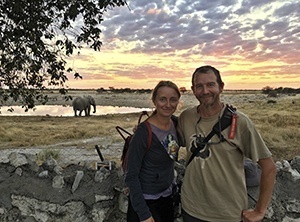 The trail climbed steadily, crossing downhill mountain bike paths – every now and then, lycra-clad daredevils zipped past us, governing their bikes with a dexterity I couldn’t help but admire. Besides us, the only other hikers were a German family – mother, father, daughter and a giant poodle dog. 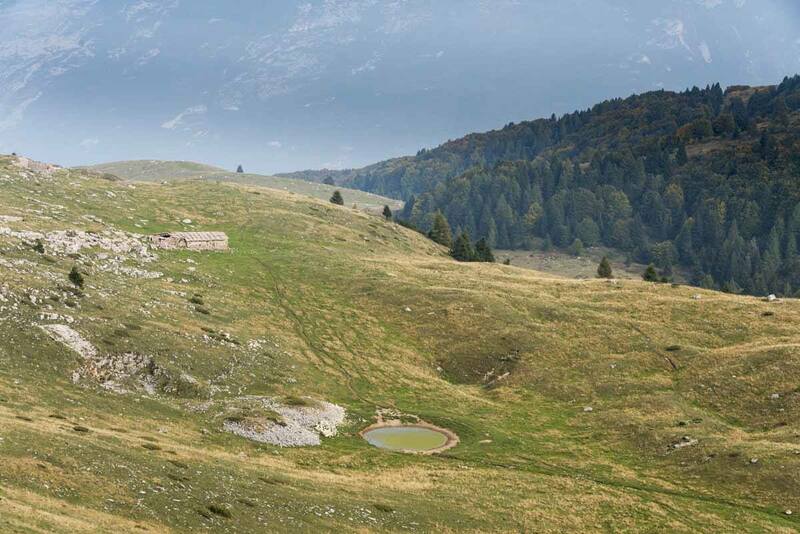 We soon reached a meadow, where we could have got one of the first glimpses of the lake below – if only the valley hadn’t been covered in clouds. The grass was dried and yellowed by the heat of the long summer months. We walked to a limestone outcrop, hoping to catch some views – all we could see were clouds hanging low, and the hazy lines of Riva del Garda’s street and houses. 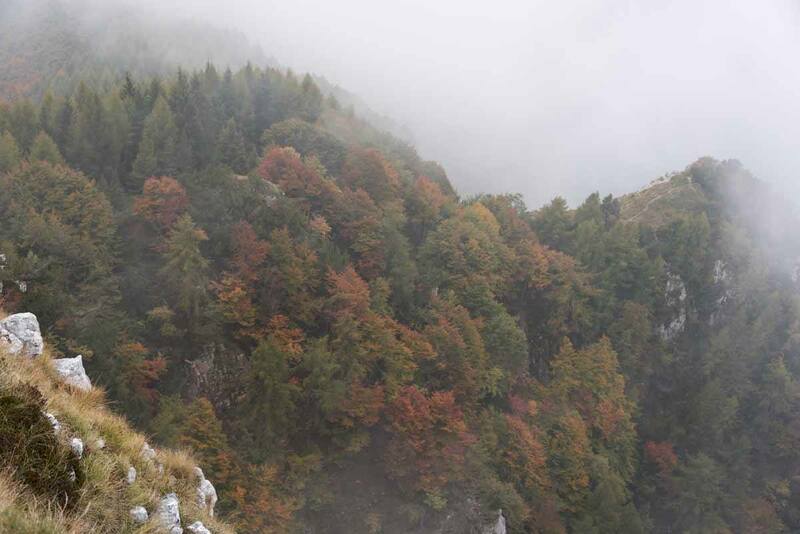 We stayed on the 601 and we walked alongside the southern ridge of Monte Varagna. The final climb to the summit of Monte Altissimo was just in front of us – a 200 meter ascent on a rocky path bordered with dwarf pino mugo plants, revealing that it’s already too high for ‘proper’ trees to grow. Soon, we found ourselves in front of Rifugio Damiano Chiesa, a small house with white and blue shutters – the colours of SAT, the Trentino Alpine Society, whose members built the hut in 1892. 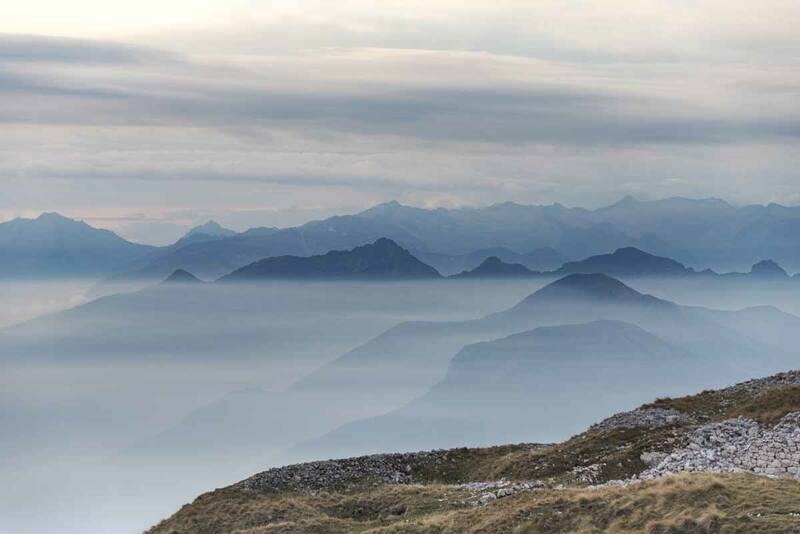 Since then, Monte Altissimo has seen war, love, death, history, and memory. It was the stage of one of World War I’s first battled between the Austrian and Italian armies. 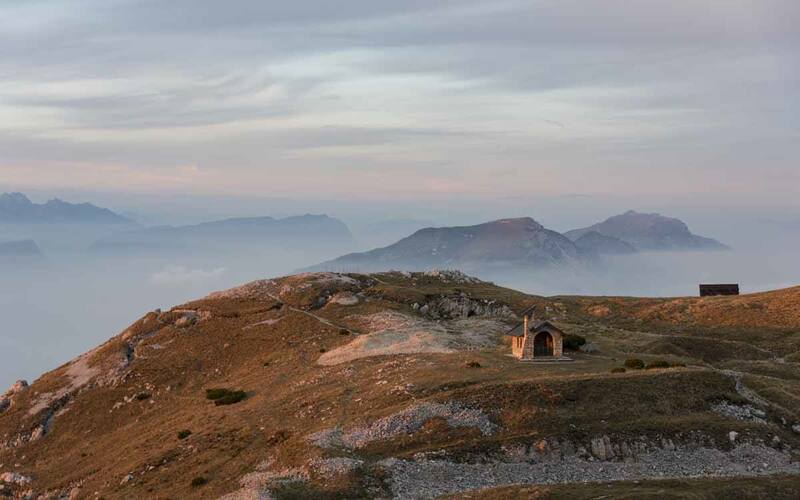 As we walked around the wartime fortifications, a sunbeam ripped through the clouds, illuminating the tiny chapel located just opposite the rifugio with a brief flash of apricot light. Just like that, then it was gone. 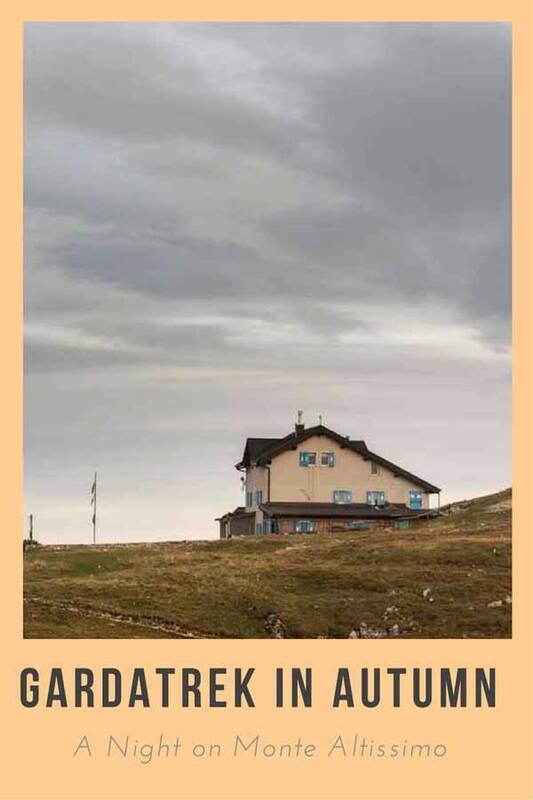 Nowadays, the rifugio is run by Eleonora Orlandi and her family, who served up a delicious feast of homemade canederli with speck and melted butter, polenta, formaggio fuso (melted cheese) and wild mushrooms. 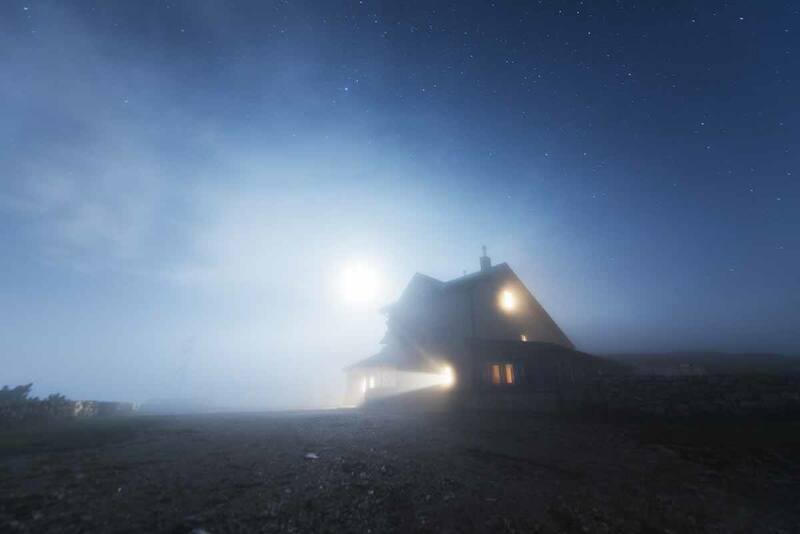 Before settling in for the night, we headed back to the top of Monte Altissimo, half hoping the clouds had been swept away and the lights of Riva del Garda would be twinkling two thousand meters below – but it wasn’t meant to be. What we did see, though, were the stars, and a moon the colour of melancholy, veiled by the fast-moving clouds. The following day, we awoke on an island. The sky was clear, but the clouds were below us, surrounding the mountaintop like a calm, floating ocean. We started the long hike south. 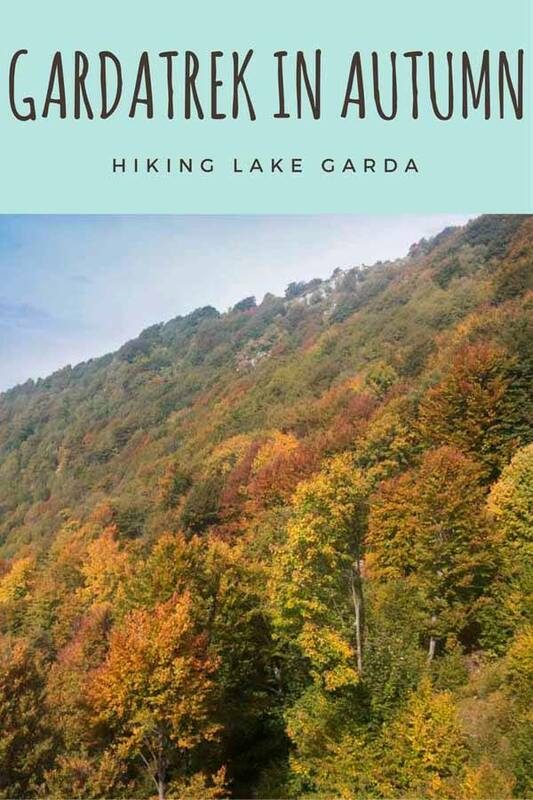 One of the benefits of Garda Trek is that the trails are all loop-shaped – you can hike the whole thing and head back to your the starting point. In summer we hiked the first stage of the trek, and after spending the night on Monte Altissimo we would hike the final one, before heading back to Riva del Garda. We spent most of the morning crossing the ocean of clouds. Visibility varied – from a few meters, to a few hundred. The clouds were streaming fast through the valley, revealing and concealing the landscape, rolling through the rills then flying away beyond the mountaintops. With every chilly draft, the wind turned summer into a distant memory. Gone were the green fields where we lay after our ascent on the Top Loop in July, rummaging through our bags for one last drop of water. Gone were the wildflowers, the sheep grazing in the high pastures. The time of log fires, of warm apple juice (or wine, for that matter), of hot stews poured over polenta was about to come. Suddenly, we saw something – the suggestion of movement, and two horns appearing behind a rock. It was a male camoscio (chamois), an Alpine deer common throughout Italy, but rare to see up close. The chamois stood less than 20 meters from us, then ran off across the path. 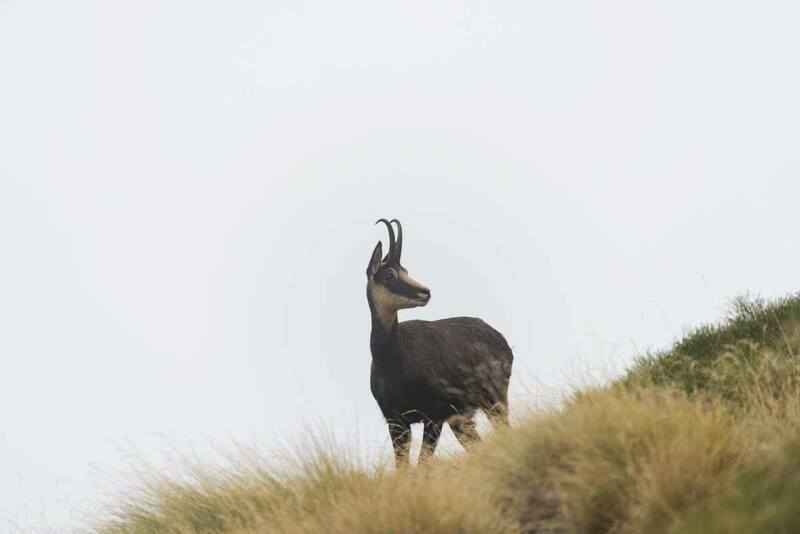 Then we saw another, and another – in total, we counted 5 individuals, grazing near the trail surrounded by mist and clouds. The path descended for another 2 hours, until we reached the top station of the Malcesine-Monte Baldo Cableway, taking passengers from 1760 to 89 meters with a quick 10 minute ride. The cable car rotated, allowing everyone to see the mighty lake below, revealing itself in all its beauty as soon as we emerged from the cloud cover. In just over 10 minutes, we had gone from autumn to a last, timid day of late summer. A warm breeze blew over Malcesine, and the lake sparkled whenever the clouds parted and the sun shone through. The town was still buzzing – the alfresco restaurants and cafés were full, mainly with German tourists munching on pizza and spaghetti carbonara. There was one last step we needed to take, before returning to Riva del Garda and closing the GardaTrek Top Loop circle. 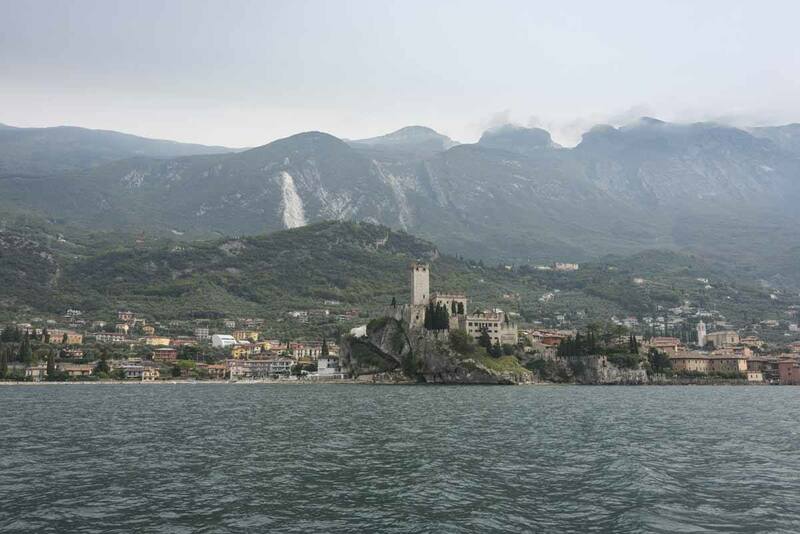 We made our way to Malcesine’s port, and hopped on a lake ferry. The cable car/lake ferry combo allows hikers to make a scenic return to Riva del Garda, after hiking the Top Loop – and what a grand finale it was. The ferry zipped from one shore of the lake to the other – to Limone on the Lombardia shore, a town famous for its lemon trees, then to Torbole, Lake Garda’s main adventure hive. There were climbers on the lakeside crags. On the water, we saw sailors, windsurfers, and kitesurfers riding l’ora del Garda. High above us, a paraglider in a green sail was dancing in the air. More adventure awaits – and over the next few months, we can’t wait to see it all. 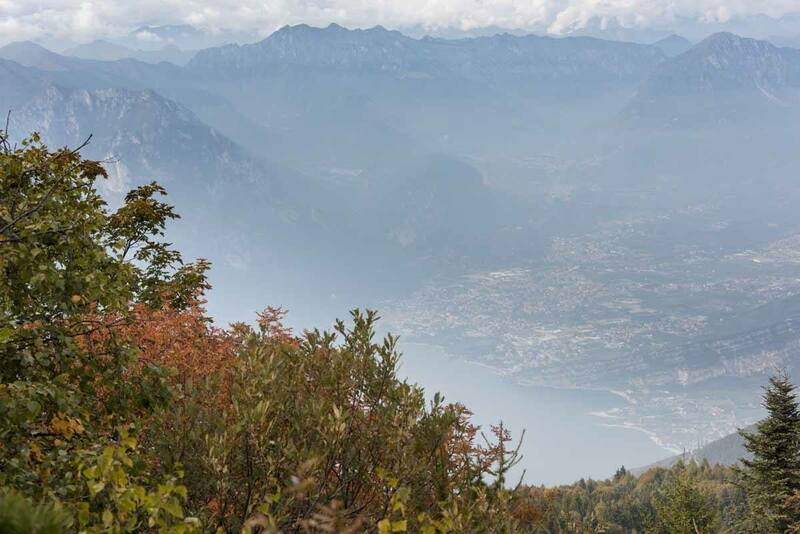 Your gateway to Garda Trentino, Monte Altissimo and the whole GardaTrek is Riva del Garda. You can reach it by car, exiting the A22 at Rovereto Sud, or train until Rovereto then bus.There are also buses from Brescia and Verona to Riva del Garda. 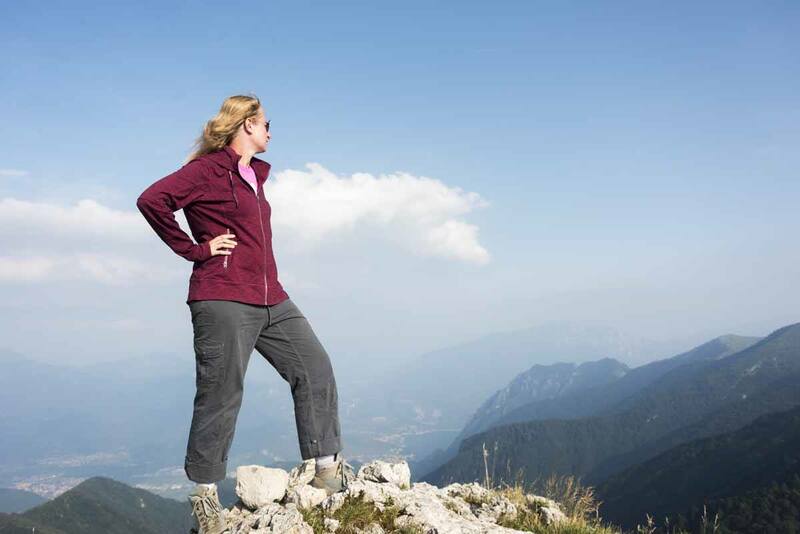 If you’re not hiking the whole GardaTrek and just want to head to Monte Altissimo, you can arrange a transfer to Prati di Nago then hike the rest until the rifugio. A taxi from Riva del Garda should cost about €40. Rifugio Altissimo Damiano Chiesa is open every day from end of June to end of Sept, and just on weekends the rest of the year. 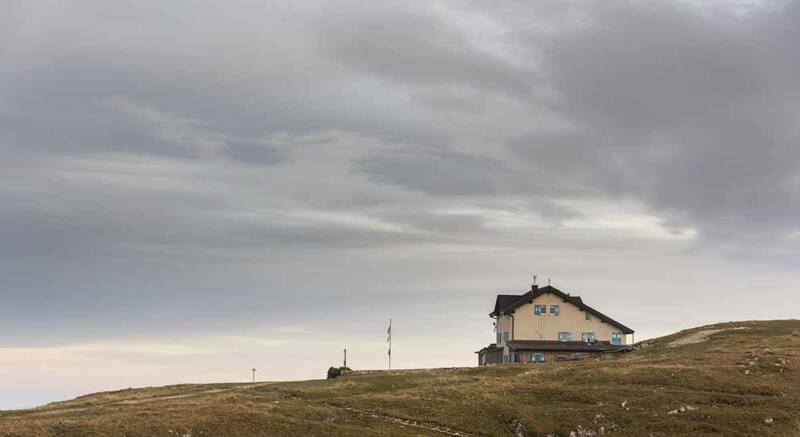 The hike we described can easily be done between June and October – double check conditions with the Rifugio owners before setting off along the Garda Trek outside these months. The Malcesine-Monte Baldo Cableway is open from March to November, and a one-way ticket costs €15 for hikers. Ferries run regularly between Malcesine and Riva del Garda in summer, and one-way tickets cost €9. We would like to thank Vale Bellotti from Garda Trentino for making this experience possible. We loved hiking Monte Altissimo! 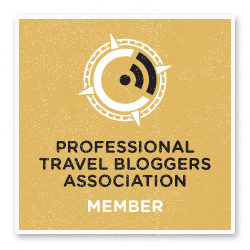 Travelling Solo in a Relationship? Why not! 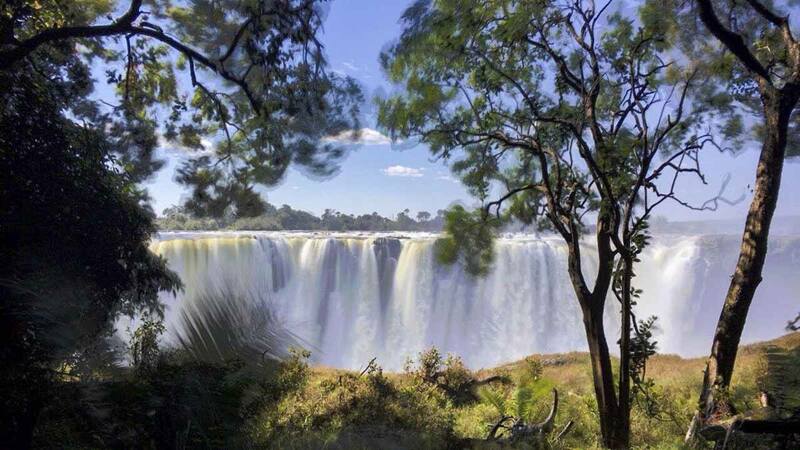 Next Post: Visit Victoria Falls – Zimbabwe or Zambia? Italy seems to be an endless list of awesome tourist destinations… Every day I discover a new one!